Linthicum Heights Secure Locksmith - "Need assistance from a professional locksmith? Linthicum Heights, Maryland has a wide assortment of locksmith companies to choose from." "Need assistance from a professional locksmith? 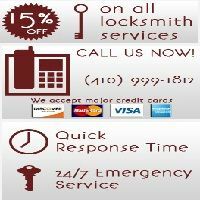 Linthicum Heights, Maryland has a wide assortment of locksmith companies to choose from." "Because you live in Linthicum Heights, locksmith service that is very affordable and available to you 24/7 can be accessed by calling the family run shop of Linthicum Heights Secure Locksmith. Once you contact us, you’ll have near immediate access to the finest residential, commercial and automotive lock and key services at the best rates, and with outstanding results. Our Linthicum Heights locksmiths are highly trained and fully licensed, bonded and insured. We take pride in offering everything that our local clients need and want. So whether you need repair for your car’s keyless entry system or want to convert your apartments over to a Master Key system, our locksmiths in Linthicum Heights are the perfect ones to do it. Here at Linthicum Heights Secure." When you notice that you need a team of professionals to secure your personal property for you. "Fully certified and background cleared locksmith professionals"